Decades ago, I was a project manager for a company which built special purpose military antennas. In those days, we kept track of things with notebooks, to-do lists, and regular face-to-face contact (although, teams often spent endless hours updating the bigwigs in unproductive meetings.) The computer and the Internet changed all that. Now companies complete huge jobs by collaborating over the Internet. Every business does project management. In fact, even planning a birthday party involves project management. We call it planning. For simple tasks, you plan in your head. As the problems get more complicated you start writing things down on a list. As the complexity rises, you involve other experts—each with their own to-do list. When ComputorEdge first produced the California Computer Expo, the event consumed everyone in the company. The Expo manager carried around a huge project binder while other team members maintained their own action plans covering their individual areas of responsibility. They coordinated through lots of meetings—sometimes as a group, but often in informal one-on-one get-togethers. The four-day expo went off without a hitch. Back then, Nutcache Project Management did not exist, but, now, I wouldn’t hesitate to use the online project management system. Nutcache offers a comprehensive, flexible solution to complex problems, yet, I find it simple enough to benefit anyone—including a small one-person shop. Plus, you can get the “basic” version free. (I hesitate to call it “basic” since this “introductory” edition of the online job planning and tracking system does so much more than one might expect at no-cost.) If I operated as a paid Web designer or AutoHotkey programmer, I would use Nutcache for its estimating and invoicing features alone. Is Nutcache Overkill for the Small Shop or Service? Quickly generate invoices from project tasks in Nutcache. If you have no employees and produce a straightforward service or product, you may wonder why you might want project management software. Routine jobs don’t require a great deal of planning. You’ve done the tasks so many times, that now you get things done without detailed outlines. 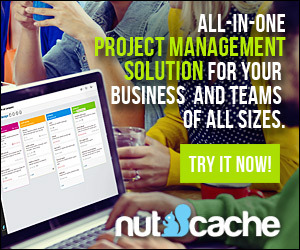 Maybe you don’t need the power tools of a complete project management system, but there are still two good reasons for signing up for a free Nutcache account: bidding and billing. I rarely find a free version of software as full-featured as the “basic” edition of Nutcache. If you have no other reason to use this introductory level of Nutcache, the built-in estimating and invoicing (two of the most critical business actions) features make signing up well worthwhile. The built-in project creation process flows, first, into a cost estimating system for bidding a job, then, as the work gets completed, through the all-important invoicing steps—needed for getting paid. Nutcache produces bids and bills so easily that I recommend the system to anyone who offers any service or product for a fee. If you do nothing else, sign up for the free version of this online service. The quick bids from project tasks make estimating easier. Once I understood how Nutcache organizes the menus, I found the project management system fairly intuitive. All jobs consist of two main phases: planning, then execution. At the initial creation point, the planning gets underway. You add tasks to the project where you embed billing rates. From there, you can immediately generate professional looking estimates and bids for submitting to your clients. You merely add the tasks (billing rates included) to the estimate and Nutcache generates a bid which you can either e-mail directly to your client, convert to a PDF file attachment, or print and mail. Since you can also generate project invoices directly from those same tasks, the Projects section of Nutcache may be all you need. While working on each task, you can either enter your hours directly or time yourself with the built-in clock. At the end of the job (or anytime during the job), you can bill a client by adding your completed work to an invoice. Note: While testing Nutcache I started a clock timer and forgot to later stop it. After 24 hours, Nutcache notified me via e-mail that it was still running. I guess it’s uncommon for someone to work 24 hours straight. Web-based software can add these types of notifications to their systems. All project-oriented businesses need some type of estimating and invoicing process. Otherwise, they either won’t get the job in the first place or, later, won’t get paid. The initial steps in Nutcache (creating a project and adding tasks) give the small shop or one-person service the features needed for those critical steps. However, more complex projects involving more people require collaborative tools. The free version of Nutcache allows up to 20 people to work on a project simultaneously. This makes managing a job with many moving parts and people at remote locations much easier. Nutcache uses a system it calls “Organization boards” (probably analogous to whiteboards used in conference sessions) for team collaboration. Although assigned to a specific project, a board may or may not correspond to a task in the Projects section. After creating a board, the teams creates lists of cards (sticky notes?) adding them to each board. The team creates individual boards for each project. Each board contains lists holding cards relating to specific action items. The manager assigns working members and guests to each board for collaboration. After creating a board, you set up work lists and add cards (sticky notes?) to each. Easy to edit and move around, the lists holding the cards act as detailed planning tools for completing action steps. The collaboration occurs at this list level with assigned members interacting by making comments, inserting work hours, and including other job specific data—as if sitting around a whiteboard at a meeting. The lists contain as much detailed as you like through the addition of cards. Each card might contain additional checklists, attachments, and comments. Plus, Nutcache allows separate invoicing for each list and separate time clocks for each card within a list. All these features come with the free version, but a number of other useful features remain locked. For one, in the free edition, every member automatically gets full access to the entire project. Bigger projects may warrant restricting specific people to only those sections necessary for their work. To get this user access control and other more advanced capabilities, you need to upgrade to a paid version. I found that the more I played with the Nutcache system, the more sense it made. There exists a little bit of a learning curve, but comfort soon sets in. It should be a snap for anyone who knows project management. It certainly beats the binders and to-do lists of the past. If I were managing a project with any level of complexity I would use Nutcache. In fact, even if I ran a one-person shop, I would use Nutcache to create projects—if only for the estimating and invoicing.